[24/7/2008 3:30PM] Guess what, I received the Evo X from Tom 5 minutes ago, very happy finally received it after long wait. Due to long distance travel, the cards are slightly crumpled, hopefully Tom received mine in good condition. 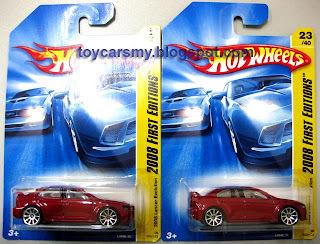 [19/7/2008 6:00PM] I have yet seen any carded Hot Wheels Evo X available in Malaysia Market. Mattel Malaysia have not released it to our local market, but it is easily reachable in other countries. Tom, my blogger friend get it to me from Vietnam via postage. By the time this post released, I have yet received it on hand. I anticipate this will make available next month, by that time, it will be the other hot cake to grab. I think they are on way now. I'm looking forward your diecast too. Hope we can do more exchange.